Each one of us would like to make the environment in which he lives beautiful and comfortable, for himself and for the people he loves. And what we choose to put into our home, whether it’s a small object or a bigger project, should reflect who we are, be unique and have meaning for us.. 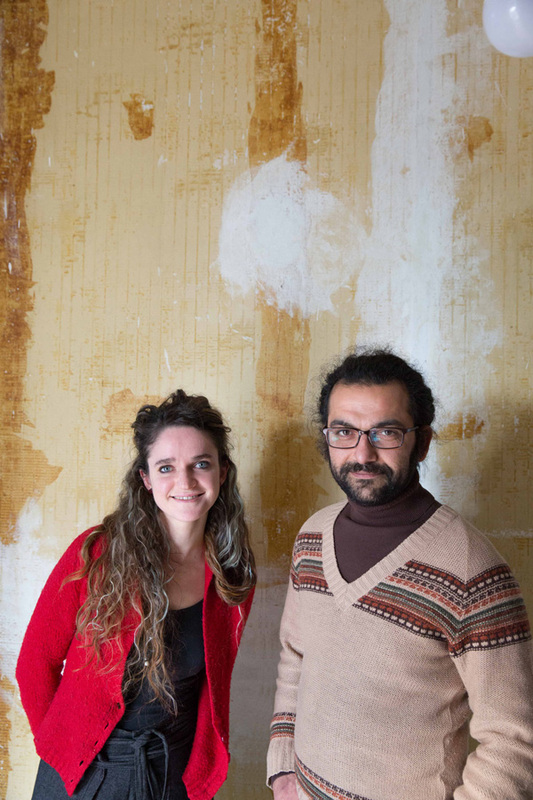 It is a subject that is very much in my heart, because it is what Mohammed and I are living in firsthand, since we started to restore our home. It is still a mess in some rooms, but thanks to little and careful choices, we already feel it as our home. And we are realizing our customized mosaic for the wall that you see here, our home entrance! 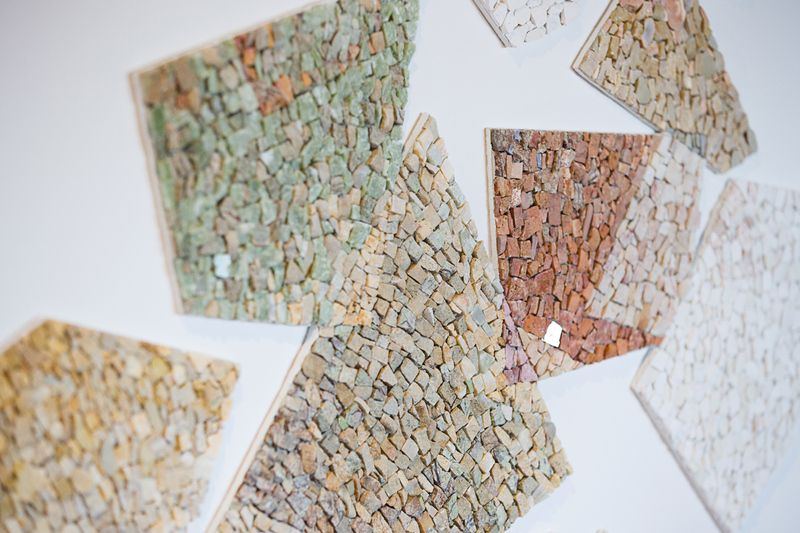 This experience allows us to really enter in the shoes of our customers who come to our shop with the idea of having a mosaic in their home. I like the dialogue that comes from the exchange of expectations and ideas, and the search for the right project. So we present some of the customized projects that we realized, just like a tailor-made dress, to fit in a context and interpret its identity. 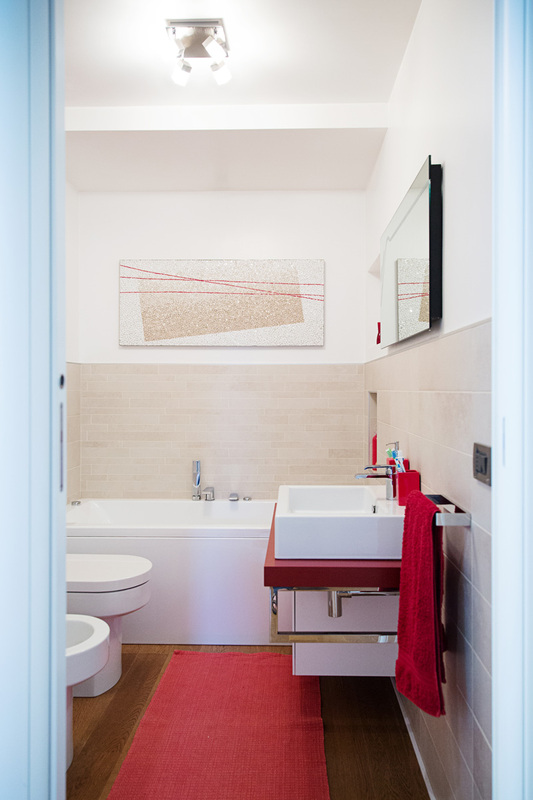 This is one of the last works we have done in an apartment in Udine. Each choice of furniture has been carefully done by the owner, design pieces coexist with historic elements of the house. 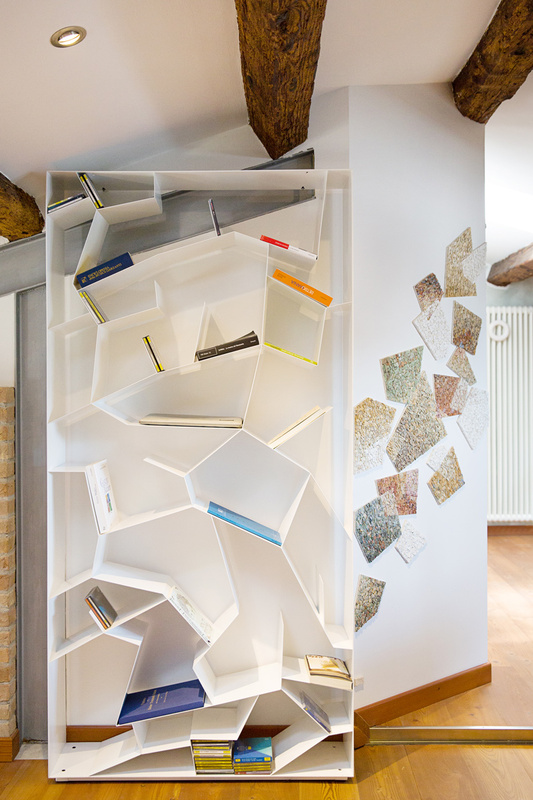 Our work originates from one of these elements, Autumn library -design Paolo Castelli for Domodinamica – which takes its shape from an autumn tree: the mosaic was supposed to be near to it. Folia it is a mosaic that moves free on the surface, without frame: it is carried by the wind, abstract as the branches of the library from which it starts. It is made of stylized and geometric leaves that create intersections thanks to misty texture, in overlay and transparency games. All this therefore has a light and airy look, even though it has the solidity of the stone. And it is in tune with the colors and materials already in the house. 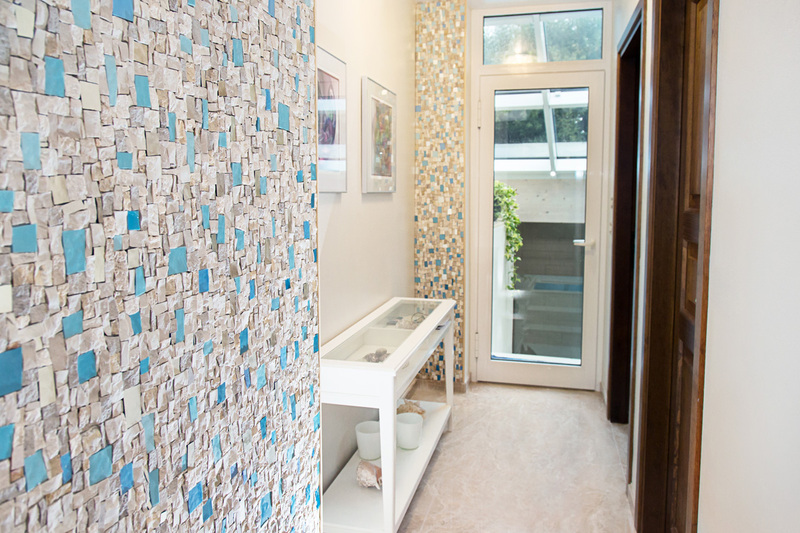 The advantage of a custom mosaic is that it can have different shapes: move freely on the wall, cover it completely or enter a frame and become a picture. Here is the example of a work whose outer form is that of a painting, but with a completely different touch, which combines the roughness of the stone with the glitter of gold and glass. Always closely connected to the environment in which it is located. 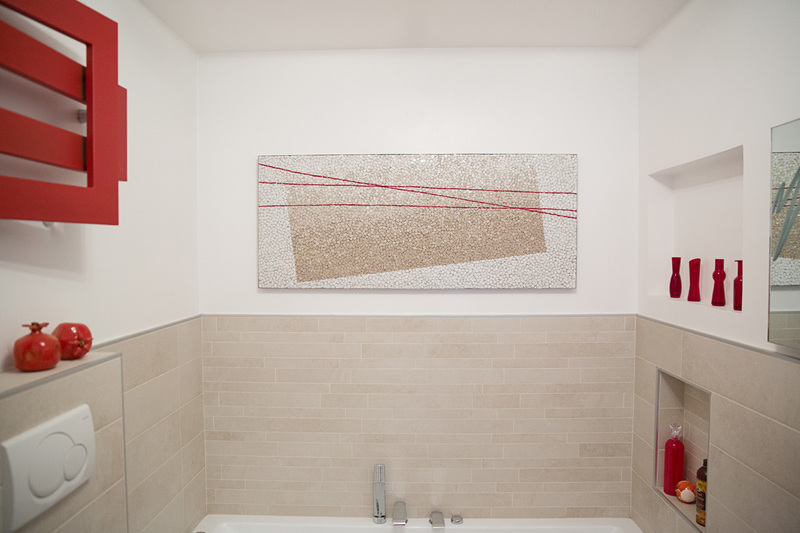 Allegra Texture (Happy texture) is in a bath where red-beige and white colors are predominant. 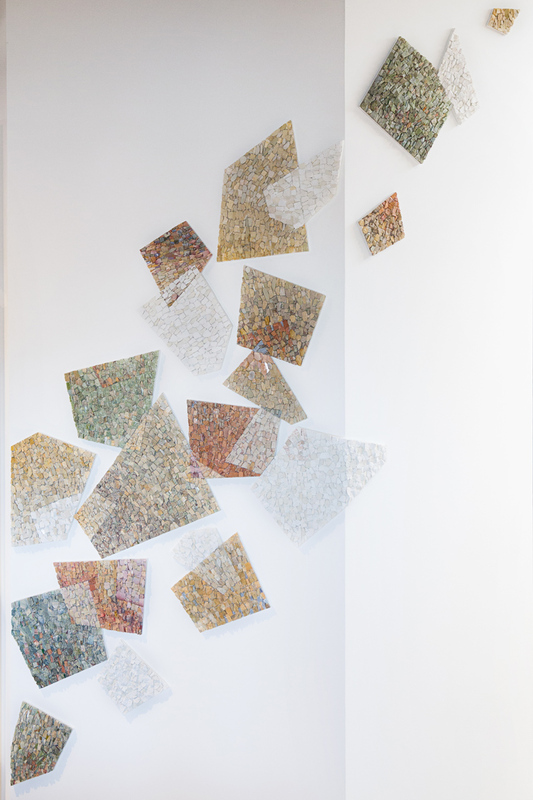 With a “dancing” disposition of tesserae pieces and a “wrapped” geometry in the composition of the design, it brings lightness to the entire environment. The red lines bind the various elements. Another possibility is the use of the full-wall mosaic, as if the walls were made of stone and glass, sculptured following a texture that characterizes the whole environment. 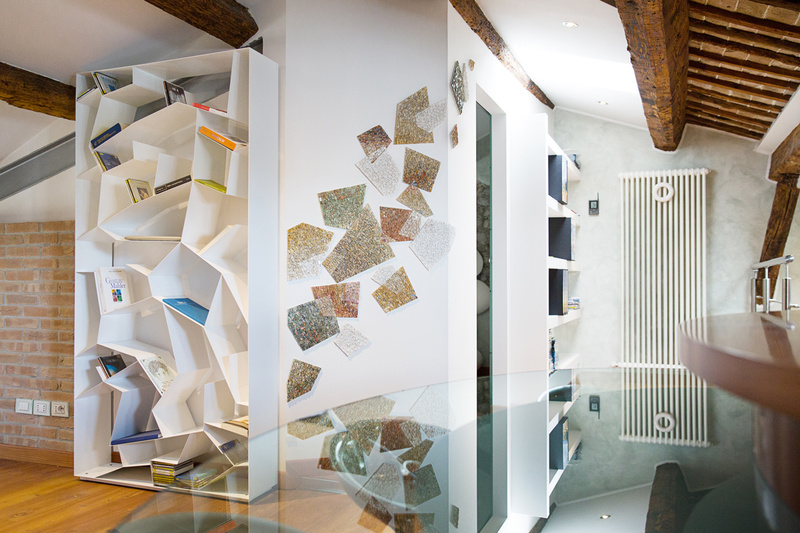 In the case of Richiamo d’acqua (Water call), the walls are two, one larger and the other narrower, not far from each other, a rhythm that is also in the mosaic texture inside. The mosaic, made mainly of stones and marbles, has a touch of blue (Venetian glass) and white gold reflections (Venetian glass gold) that create in the observer the suggestion of water. The work in fact is in the entrance corridor to the pool of the house. We have repeatedly experienced how our “customized mosaic” works, and for this I feel that I can promote it with my heart. I’m sure that what we do is really unique, both in the idea and in its realization. 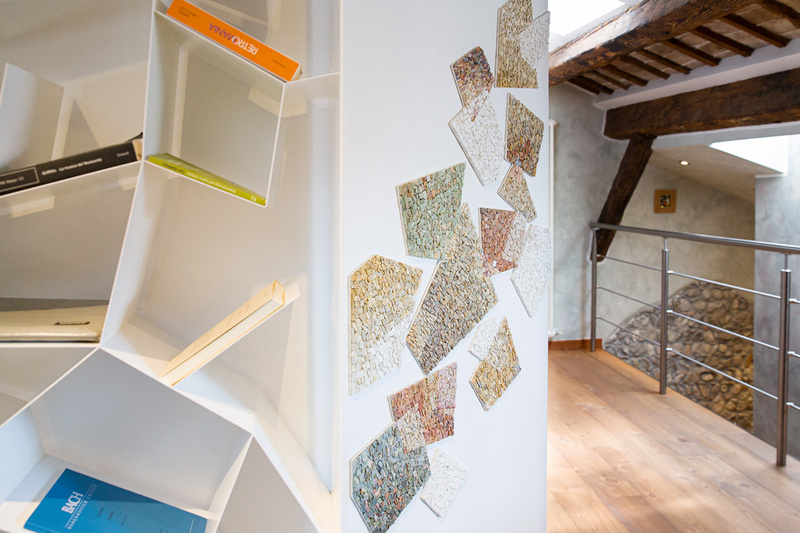 The art of contemporary mosaic is handmade, so far away from industrial prints and reproductions. It uses ancient, but unusual materials, such as stone and glass. It is both two-dimensional and three-dimensional, distinguishing itself from painting and sculpture. And then we specially design it for and with the customer, for the place where it has to be inserted in!